New technologies can redefine existing usage patterns. One of the biggest pains when you run you application on the desktop is crash. Nobody likes it. One of the most traditional pattern to prevent loss of work during crash is to save your work all the time. Just think how many times you pressed “Ctrl-S” for the last hour of work using some desktop tools. Cloud can redefine this painful behavior by saving your work as you type. This is how cloud applications like Google Apps save your work. Save is a visible part of of the iceberg. Cloud infrastructure allows you to rethink the way your application work and communicate with cloud services. CAD systems are moving to the cloud and it is interesting to see how same ideas are coming into practice with new cloud-based CAD systems. 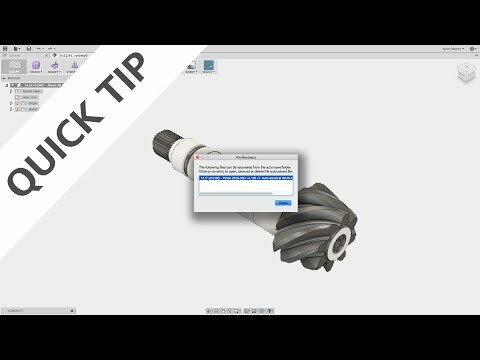 My attention was caught by Autodesk Fusion360 video explaining how Autodesk Fusion360 is using cloud technology to eliminate potential loss of your work in case of application crashes. What you can learn is that Autodesk Fusion360 saves your work as do it with a predefined frequency and send all data to the cloud when it can be retrieved in case of application crash. Onshape is developing full-cloud CAD application, which runs in the browser. Onshape brings a different perspective on use of cloud technologies and potential crashes. Article 7 Frustrating CAD questions you will never ask again speaks about “Save” too. With Onshape, there is no save button. Onshape is constantly saving your Document as well as keeping track of your every move. From new features to deleting parts, it’s all recorded in the workspace history and can be restored at anytime. This has unique benefits. Not only do you and your peers never need to manually save, you can recover from any error, even if it was made days or months ago. You can learn more about how Onshape infrastructure works from Onshape blog. Navigate to the following article written by Dave Corcoran, Onshape VP of Research and Development – Avoiding the blue screen of death – Welcome to a new generation of CAD reliability. Dave’s main point – redundancy can change the way cloud application behaves. Here is a passage to explain that.